Mexico, Guatemala and Belize were shaken by a 7.1-magnitude earthquake on Monday morning, according to the United States Geological Survey. The very strong quake rocked the southern part of Mexico and surrounding countries in Central America and has killed at least three people in San Marcos, Guatemala, according to reports. While the extent of the damage is unclear, Guatemala Communications Minister Alejandro Sinibaldi wrote on social media that there had also been reports of landslides in the southwest of Guatemala. “All our effort is aimed at assisting those affected,” Guatemala President Otto Perez Molina said on Twitter. The quake’s epicentre was about 8 kilometres northeast of Puerto Madero and about 16 kilometres southwest of Tapachula in the southern region of Mexico, at a depth of 92 kilometres. It struck at around 6:23 AM local time. The strongest reports of shaking were centered around Guatemala City, which reported strong to very strong shaking. 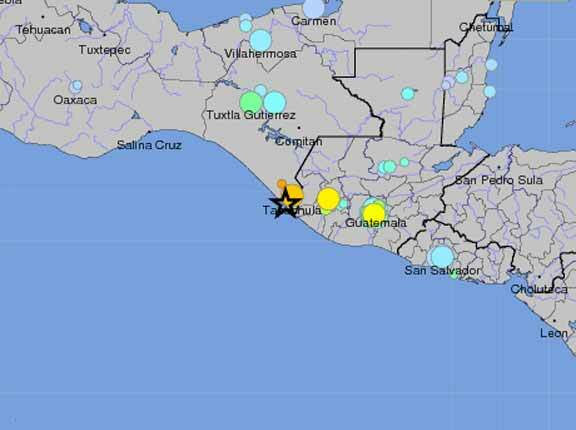 There were reports of shaking as far south as El Salvador and as far east as Belize. People in Bullet Tree, Belmopan, and Hopkins have told me they felt it.